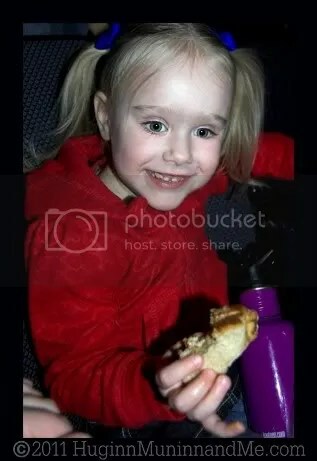 Last week T got to go to the circus for the first time ever! We were BOTH beyond excited about this event, and it lived up to every one of our expectations! 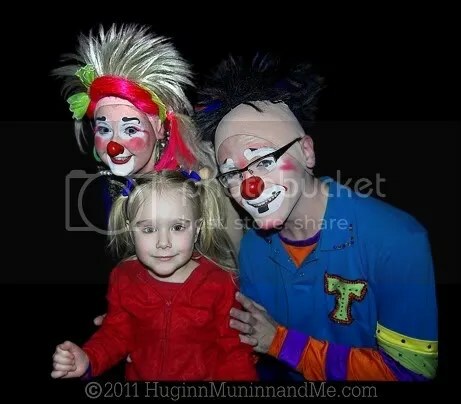 T LOVED the clowns! When they came up by our seats she said “That clown’s for me – he has a ‘T’ on his shirt!” She really enjoyed her up close and personal meeting with these colorful creatures, and after we got home she lamented “I WISH I had asked those clowns if I could squeeze their shiny red noses. . .” Next time we’re TOTALLY going early for the pre-show, so she can meet all of the performers in person! 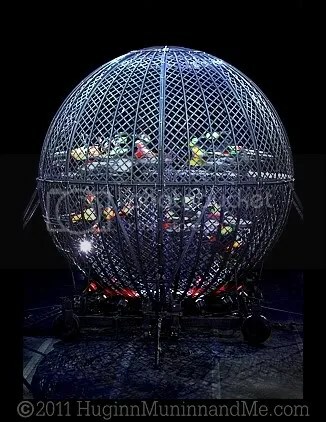 The trapeze mesmerized Teaball . . . her eyes grew bigger and rounder with every flip and catch. She shouted “BE CAREFUL!” And when one of them slipped and tumbled to the net below, I thought she might have a heart-attack! You can’t have a circus without the tightrope walkers, and T was absolutely fascinated by them. She learned how to use the balance beam in her gymnastics class, so she was really able to appreciate the skill behind balancing on a ROPE “sixty-thousand minutes high” in the air (don’t ask me, she’s been tossing random numbers and measurements around like mad lately)! Then they started standing on each-others shoulders and stuff. . . amazing! 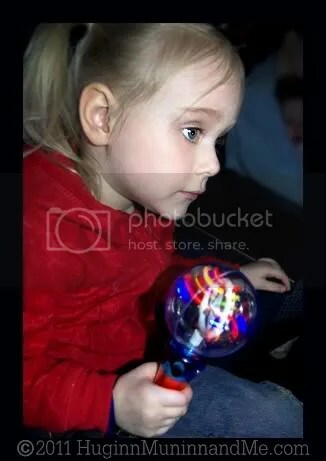 One should always have spinner lights when one goes to the circus. I got ours on Amazon well before the show to avoid spending hundreds of dollars on souvenirs ($5 vs $20). T had a blast waving that thing around, but often became so entranced with what was happening in the rings that she totally forgot about it happily spinning in her hand. . .
T is very into Ni Hao, Kai-Lan (a cartoon show about a little girl from China), and so really appreciated the Chinese dragons that came out with this act. She was so enthralled with them that she didn’t even notice the people with their balance poles. . .
. . . until they started doing things like this! Once again, I noticed that her real-life gymnastics experience enhanced her understanding of what was happening on-stage and helped her comprehend and really appreciate how astounding these people and their tricks actually are! These three came onto the stage all twisted up together in a tiny little box. Then they started doing crazy stretchy bendy stuff, which was pretty darn weird. . . but we liked ’em! 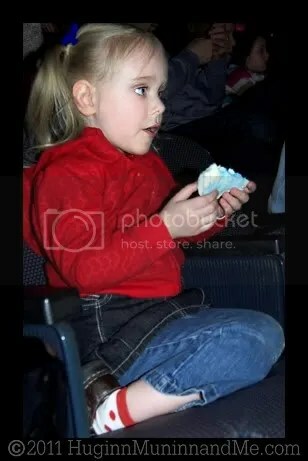 I made sure to bring loads of cotton candy and popcorn with us to the show. 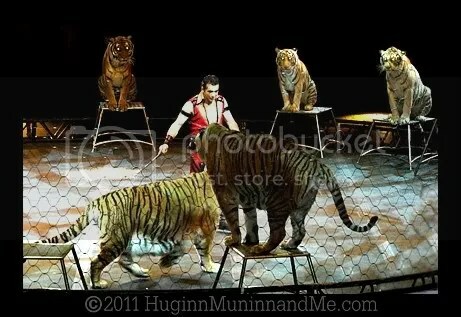 These are circus staples in my opinion, and also happen to be huge favorites of my little lady. She happily munched her way through the show! 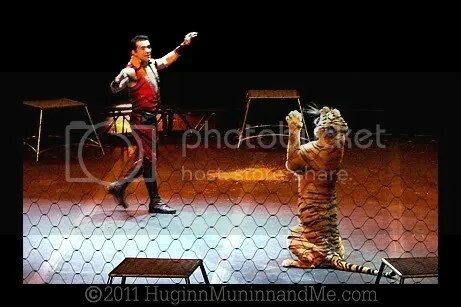 The tiger trainer was neat, and T could definitely hear the pretty kitties growling at their trainer. She worried out loud that he might get bitten. He didn’t, of course. 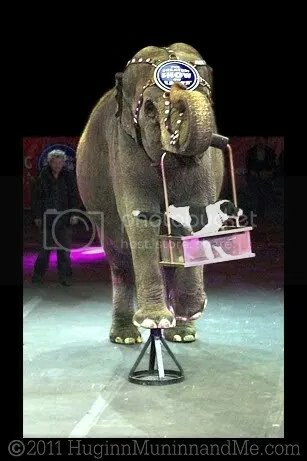 T enjoys a peanut-butter and jelly sandwich as she notices that the ELEPHANTS have entered the arena! If you didn’t already know it, my daughter is obsessed with elephants. 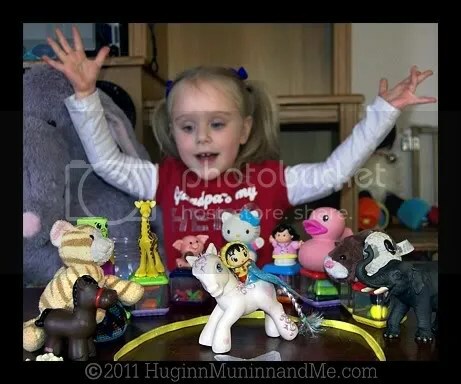 She was SO excited when they came on – SO MANY ELEPHANTS! Big ones and even little tiny baby ones! It was very exciting for her to see them do silly tricks like standing on their heads, or spinning around little tiny chairs. . . But Miss Puff was REALLY impressed when a little dog hopped into a basket and that big ol’ elephant picked him right up and spun him around! She’s been going on about it for days! Daybaby A came with us – or rather, we went with her and her mom in their car. A was recovering from a stomach flu that she had gotten two days before. We thought she’d be okay, but. . . the poor kiddo slept through the entire first half! She was not feeling very well at all. 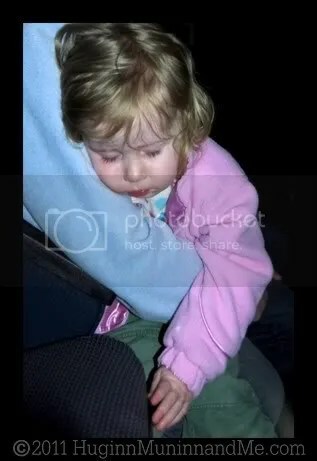 When the lights came up for intermission, she woke with them, and when the second half started she began to cry. She was inconsolable. We decided to leave after the first act of the second half was over, because poor A really needed to be at home in bed. 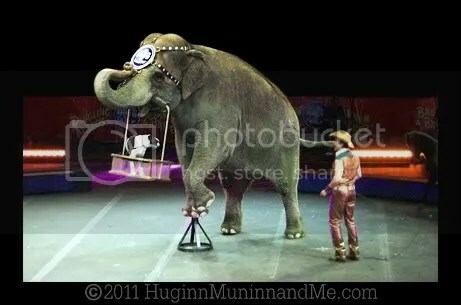 I am so very incredibly proud of my darling T for being SUCH a big girl when we had to leave the circus early. No tears, no whining, no tantrums. This was hands-down the most amazing thing she has ever seen in her entire LIFE, and I felt so sorry to cut her fun short. 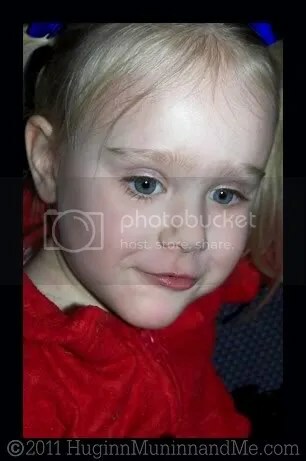 When I told her that we would have to go, she looked up at me with her big blue eyes and said “But mommy. . .I think they still have some tricks they want to show us. . .” It was so sad! I explained to her that A was not feeling very well, and when she looked at her and saw that she was crying and so very sad, she nodded and said “Yeah, A is feeling sick, she should go home and go to bed.” That was it. What a good big girl she is becoming! I was so sad for both of the girls. Sad that A was feeling so miserable, and sad that T had to leave because of it. She told me later “When we had to leave the circus, my heart broke into lots of little pieces.” Mine too, kid. . . but there’s always next year! And believe me, we will be there! 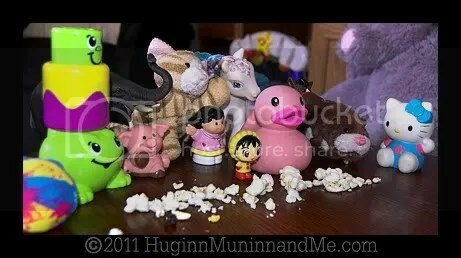 As soon as we got home, T set up her own little circus and spent hours making random toys do random tricks. She even put a ribbon down to be a ring for the performers! And she had an audience – complete with leftover popcorn snacks. 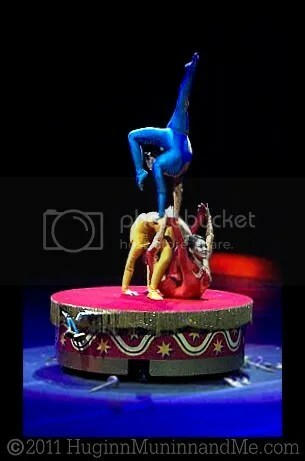 Her circus spinner helped to provide the atmosphere she was looking for. . . and she told me that I had to watch and take pictures. Naturally. 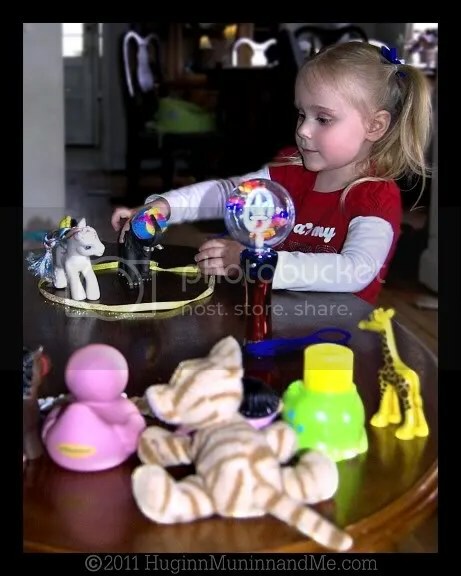 Because what kind of circus doesn’t have at least one mommy with a camera?! Hi there. 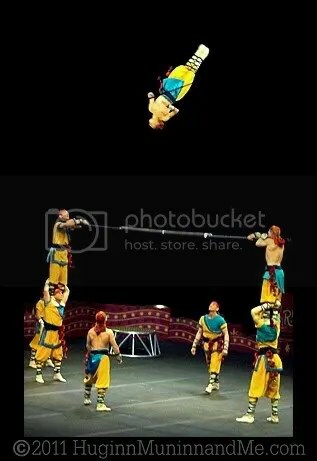 We saw the circus last month in SC courtesy of our friends from church. What an amazingly selfless sweetie you have there! I know both your hearts broke when you had to leave early but because there is the anticipation of next year’s show, there is HOPE! What can I say? My grandbaby is awesome! I think I’ll have to go with her next year and get in on the fun – ALL of it! this is cute n all, but clowns freak me the crap out! i’m not gonna lie. i will try to get these images out of my mind. How fun! Even though clowns freak me out. Big time. I can’t resist telling you that this is all so adorable… even though I kind of don’t like circuses or clowns..
Hope you are enjoying great spring outdoor playtime weather.. I don’t know how I missed this one! So your pictures are exactly why I need a better camera. I had to trash pretty much all of the pictures I took. It was as great as T described! I’m still so very sad that we had to leave early. Although it was folly for me to have tried in the first place because A and I were so sick. I’m sorry. But I’m super glad that T loved it so much. 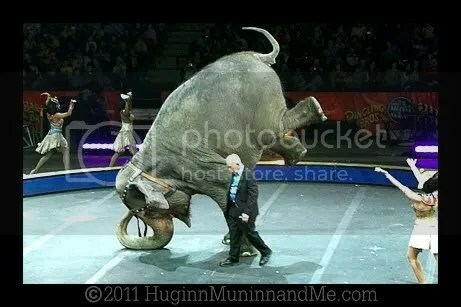 And at least A was also super impressed by the elephant holding the dog in the basket. Even if the rest was largely lost on her. Next year will be splendiferous!